Yesterday I went to the Lasik Surgery Center (LSC) at the Megaclinic in Megamall to claim my free Lasik surgery screening. Yes, it's free! Why, you ask? I joined a promo by Business World and Lasik Surgery Clinic where all you need to do... is tell them how lasik surgery can change your life, and for a mere 50 words and 5 minutes of your time, you get a free Lasik screening and 20% off on the actual Lasik procedure package! The prize of course is a free Lasik procedure, and only those who are good candidates for Lasik can qualify for the contest. I was really planning to get my eyes corrected this year or next year, but since the opportunity presented itself, I thought, why not? It was Batangas Fiesta yesterday so we were on Holiday, so I got myself an appointment at LSC and went. It was quite interesting really, aside from the usual test like reading the letters and looking at that red house in the distance, they made me take other tests like looking through a tunnel and another where I had to stare at a fuzzy red light. Another interesting test was when they literally touched my eyes with a probe thingy after the dropped an anesthetic on them, and when the doctor peered into my eyeballs after the dilated my pupils. They also showed me a video presentation of how the actual procedure will happen, and a one on one discussion to clear any doubts and answer any questions I had. I am really hoping to win this contest (I'll post my entry only if I win) so I can get that free Lasik! That would be awesome! Pray for me aight. Dude, an unsettling shot... although since you went there, should you win I think it would be best to apply Malcolm McDowell-esque mascara, play WWII video footage to Beethoven audio, and revel in your capacity to think evil thoughts during the procedure. The best of luck. Hahaha! 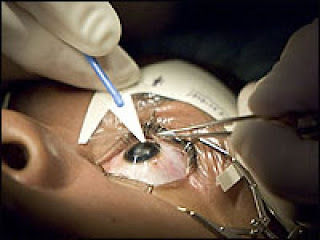 The photo is actually from a real Lasik procedure website of some sort, and I found it actually captured what i had in my mind about what the procedure would look like: totally disturbing!